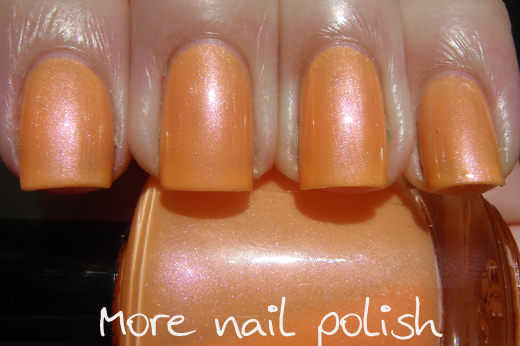 I have some pretty polishes today from indie brand Lilacquer. 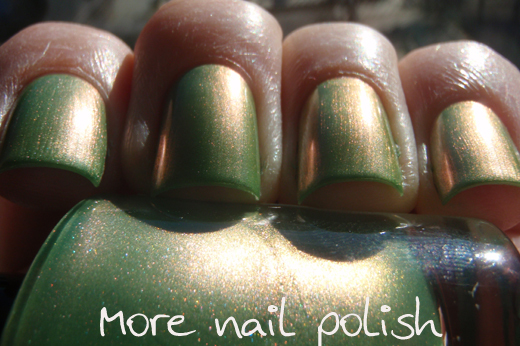 These four polishes are from the recent The Fifth Element Collection, I'll bring you the other four shades tomorrow. I love that she themed this collection after The Fifth Element Movie. Can you believe it's been 15 years since that movie was released! We own this movie on video, but who the hell still has a video player these days, right? I really must search out and find a DVD version, cause it's a classic cult movie for sci-fi geeks. 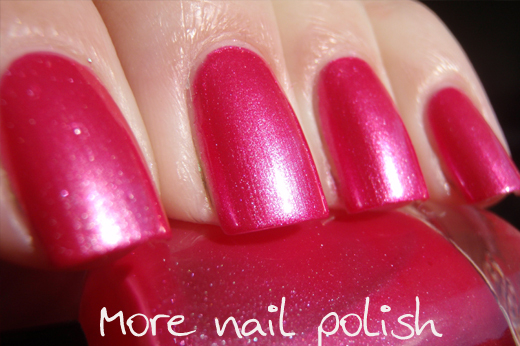 Fhloston Paradise is a bright magenta pink with a bright blue shimmer. 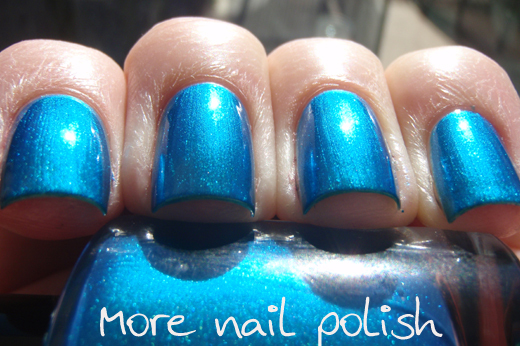 The blue shimmer shifts to bright pink at acute angles or on the edge of the nail. The Diva Plavalaguna has a aqua green shimmery base (which I feel is a little green that than these photos show) and it shifts to a bright violet blue shimmer. 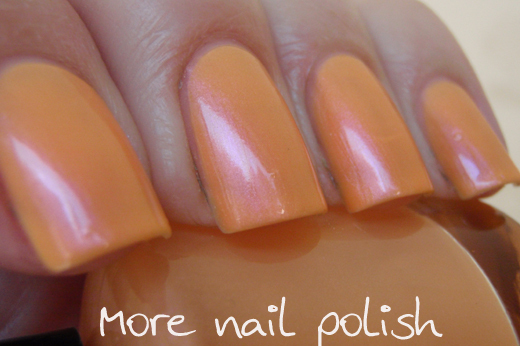 LeeLoo Multipass is pastel orange jelly with a pink shimmer. 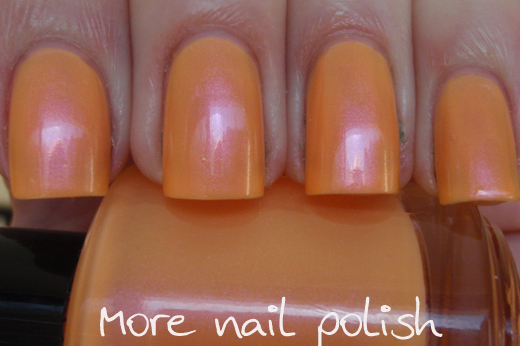 The pink shimmer shifts colours to become a light golden orange shimmer. 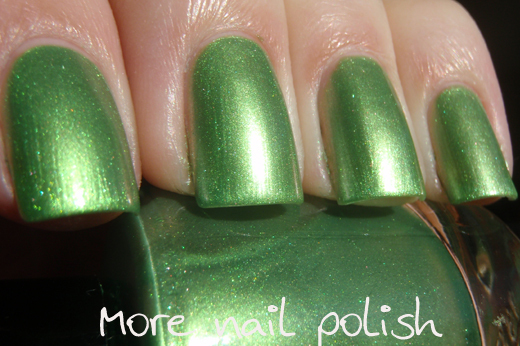 Super Green is a bright shimmery metallic green which shifts to a gorgeous golden orange. All these swatches are three coats on their own. 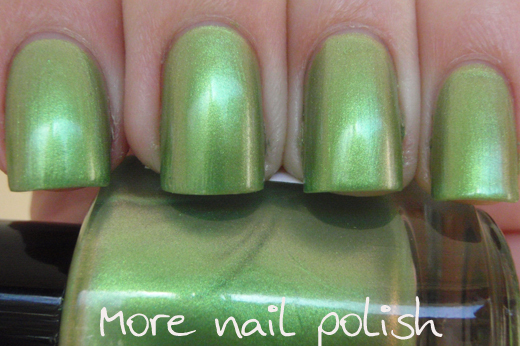 They dried to a satin finish as can seen on Super Green, which didn't have top coat applied. 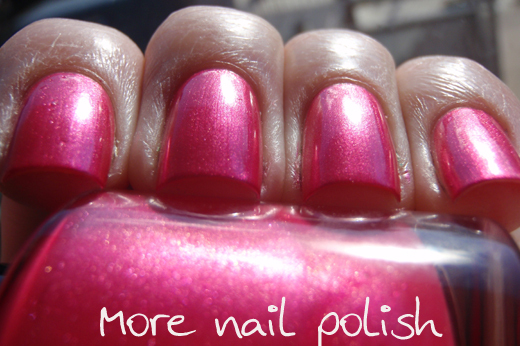 The other polishes all have Seche Vite applied. After my surprise yesterday at seeing Picture Polish 'warning' over black, I've realized I really need to try all these over black too. I'm sure they would look fantastic and the duo chrome would really pop a lot more. The formula on all these were excellent. I thought the shimmery finish would make these feel a little frosty and streaky, but as you can see they are all beautiful and smooth. They were easy to apply and dried in a good time, although I did notice that I could not apply Seche Vite immediately to the sticky nail. 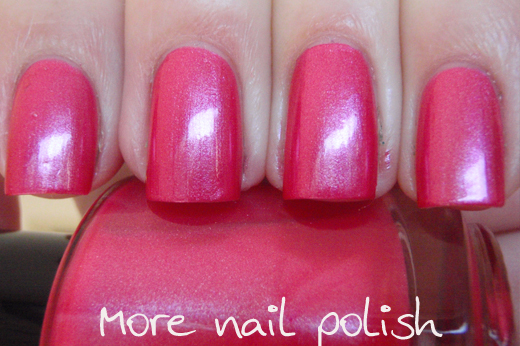 I did this twice and the polish wrinkled. But if you wait until they are 90% dry then it's no problem, I probably only needed to wait 5 minutes to make sure they were fine. I reckon that 90% of all indie brands create glitter bomb polishes, so it's lovely to find an indie brand that specialists in something else, and in this case it's fantastic duochromes. I really was impressed with the quality and finish of these and have no hesitation in recommending them. Also, I own a lot of duochrome polishes and each and every one of these is a unique colour combination in my collection. 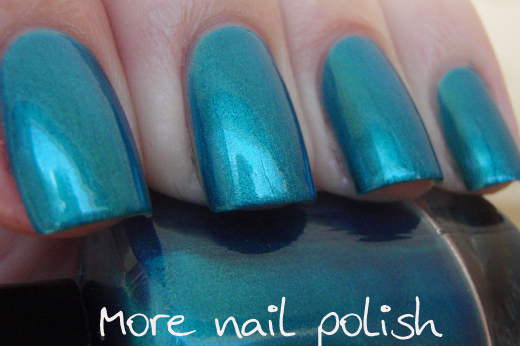 Lilacquer polishes are available from the Lilacquer Etsy store. 15ml bottles from the Fifth Element collection are $9.00 USD. 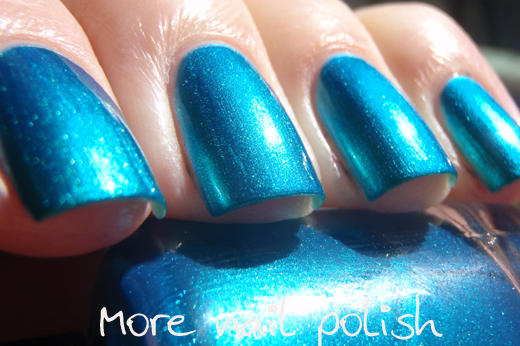 Also, for anyone looking for colour morphing topcoats as shown in my post last year, you can grab a ready made bottle from Lilacquer. Selkie = Green to Blue, Lycanthrope = Gold to Green, Kitsune = Red to Green. 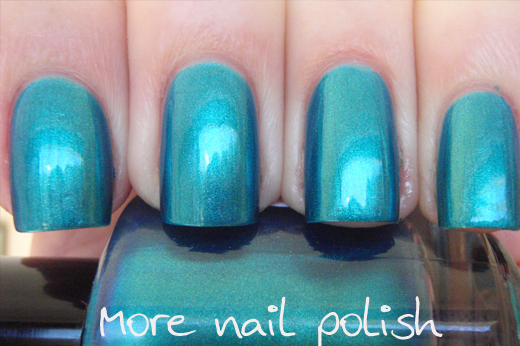 These polishes were sent to me for review. Nothing named after Rudy Rod? Awww.... Love Leeloo Multipass. Even now, my brother and I will yell out "Multipass!" when talking about admission/bus passes/movies.